Junior Seau was an NFL player that had the rare combination of longevity and all-star ability. 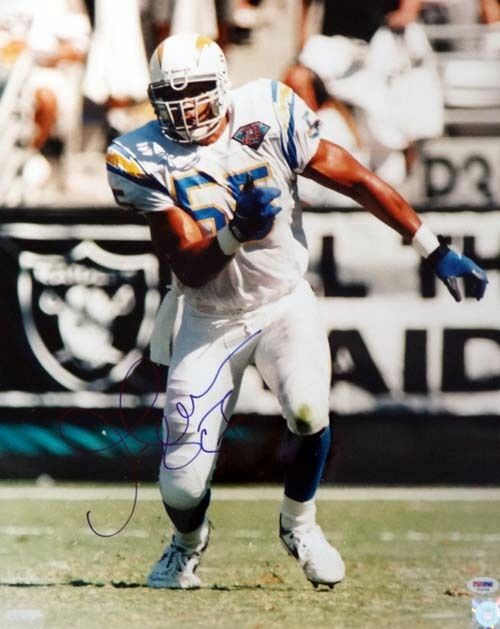 While he suffered the same stigma as many other players on defense in regards to hobby love, Seau was a fan favorite throughout his illustrious career. 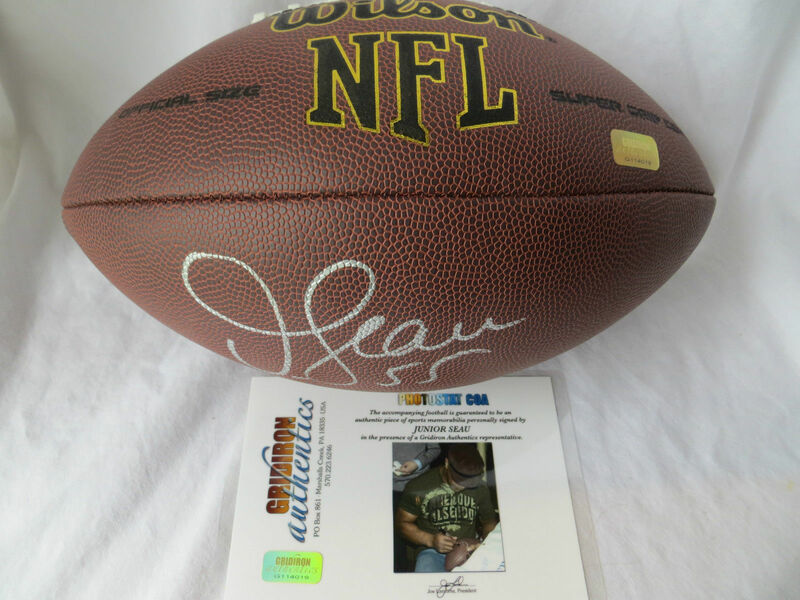 As a result, Junior Seau cards and memorabilia have a relatively strong following. 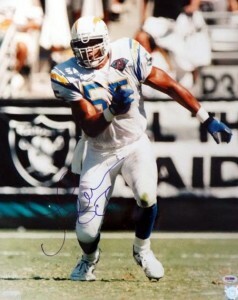 A ten-time All-Pro and 12-time Pro Bowl participant, Seau played at a consistently high level during his 20-year career and was named the AFC Player of the Year in 1994. 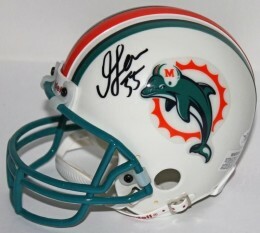 Seau is most remembered for his years with the San Diego Chargers but he also played for the Miami Dolphins and New England Patriots. Despite his remarkable tenure in the league, the ultimate prize evaded Seau. He came up short in the 1994 Super Bowl as a Charger and the 2007 Super Bowl as a Patriot. Even without a Super Bowl Championship, Seau should be a lock for the Hall of Fame and was one of the most respected elder-statesmen of the NFL. 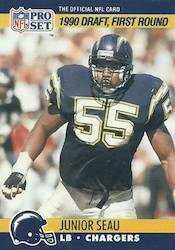 Unfortunately for collectors, Seau's rookie cards came at a time of over-production, which has kept their values low. 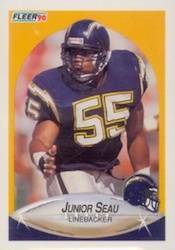 Seau has five low-end rookie cards that can be had for a few dollars. Like most players from the era, Junior Seau autographs may be a better option. With text and no branding or logo, Seau's Action Packed rookie is the least authentic looking card in the group. However, the card distinguishes itself with a foil border and crisp image. It's all downhill from there. 1990 Fleer Update showcases an action shot of Seau that is bizarrely set against a yellow arch background. The faux-glare spots on the bottom corners of the card are the icing on the cake. 1990 Pro Set brings another bland offering but with its solid design and complementary color scheme, this might be the least offensive of the big brands. What the Score rookie lacks in aesthetic appeal, it makes up for in total number of included colors. 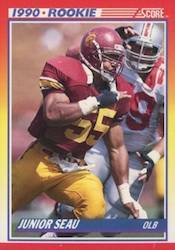 The rainbow card also is the only one of the first-year Junior Seau cards to show him during his college days as a USC Trojan. 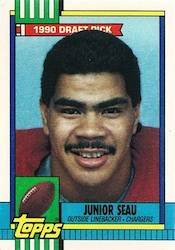 Junior Seau's 1990 Topps rookie card is only one to feature a non-action shot of the young linebacker. The image helps showcase the youthful exuberance Seau possessed as he came into the league. With all the lower tier rookie options, many collectors look to the 1990 Topps Tiffany #381. 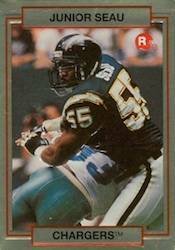 Although it is not an official rookie card, the Topps Tiffany edition is widely considered to be the most valuable of the 1990 Junior Seau cards. JUNIOR SEAU 2000 DONRUSS PREFERRED SIGNATURES AUTO AUTOGRAPH HOF CARD! 1996-97 #22 Junior Seau Topps Finest Jumbo 4" x 5 5 8"
Below you will find an example of what Junior Seau's authentic signature looks like. This can be used as a first point of reference for determining the legitimacy of autograph memorabilia, but is not a substitute for having your items authenticated by a well respected professional autograph authentication company. Some of the trusted sources within the sports memorabilia market include the following companies: PSA, JSA, Steiner, Tristar and Mounted Memories. Click on any of the images below to view full size photos. Signature is consistent but not very distinguishable. The first character is his letter "J" it can best be described as an awkward looking "9." It flows into a unique "S" that resembles more of an awkward "8." What could be described as something looking like a lower case "w" with a long tail follows. The inscription "55", his jersey number is always present.